Regent Village 1. 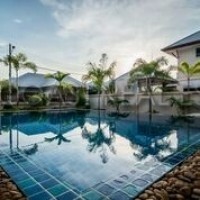 A very unique property set within a secure village environment, located conveniently off of the Pattaya - Bangkok motorway (No 7), and the Rayong - Laem Chabang highway (No 36). This Bali style house has a very unique and inviting entrance, as behind the main front doors is the atrium style Jacuzzi pool. The house is nice, clean and bright, and offers 4 generous bedrooms, all with walk in wardrobes, and large attached bathrooms. There is a large European island style fitted kitchen, leading to the open plan living-diner. From here it leads out onto the landscaped back garden, sala, and patio area. The owner with sell the property partially furnished. The title deed is held in Thai name, with transfer fees split 50-50. Living area : 360 sqm.